Why is it important to promote tourism? Tourism provides a solid economic benefit to our local economy. A healthy tourism industry has a positive economic impact that pays dividends in ways we don't always realize. $14 million in local tax receipts. 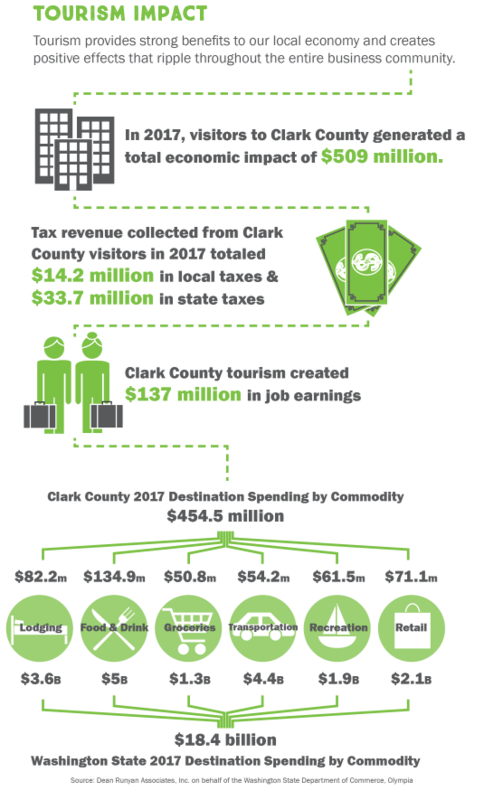 In 2017, average hotel occupancy in Clark County was 73.8% with more than $2.8 million collected in Lodging Tax and an ADR (Average Daily Rate) of $112.76. For a national perspective on tourism, visit U.S. Travel&apos;s website to view a highlight of country-wide travel impacts. Information contained on this page is considered Destination Reports, owned by Visit Vancouver USA. Reproduction or distribution of these Reports, in whole or in part, without written permission of Dean Runyan and Visit Vancouver USA are subject to legal action.